We used to frequent the Windjammer. They used to serve a mean halibut and salmon burger, perhaps the best around. Overall their menu is very tasty and the service there was consistent.They had a good selection of beer and the liquor was priced well. If you want a solid meal and aren't too concerned about the ambience this is the place to go. We enjoyed the $4 wheat ale draft special. $6 buys a small cod fish n' chips. Very tasty, and great for a casual pub dinner. They also have some British curries which we didn't try. The service was prompt and good and the atmosphere was cozy. Are You Ready For Another Round of Deep Fried Goodness? Despite the name that would suggest otherwise, the Windjammer Inn in Vancouver is no place to rest your weary head and bunk down in a strange bed for the night. It’s a straight up pub, of the British persuasion (well a Canadian representation of which at least), located right down there on Main Street. So yes, this is another in the “Tasting with Tee” series. Immediately seduced by the sandwich board outside that trumpeted a special on their 2pc. Fish and chips, along with a wheat ale of sorts, our minds were easily made up. That was until the cheery server passed by our table with a plate of something that smelled very good and so we had to ask, “what’s that?”. A batch of slightly fiery, battered shrimp she replied, and our volley of “we’ll have that too”, was easily obliged. A hint of some spice made these a touch “hot”, and they had a very crispy coating making a whole plate of them a meal in themselves. Perhaps we were very hungry and got deceived by the whiff of aroma coming of the plate we’d seen earlier, but I would rate these just okay. Probably wouldn’t order them again knowing what they were like in hindsight. After getting through a good portion of our first round of chilled beer, delicious by the way, the main part of our order arrived. First thoughts were that they were lighter in color than the earlier shrimp, a good initial sign. Checking the underside of each piece on my plate, I was also pleased there was not a puddle of grease nor were they soggy on the hidden side. The fish itself was fresh, tender and flavorful, and for portion size, they were quite good as well. I enjoyed the level of exterior batter on them, not cake-y as is seen at too many fish n chips joints. The accompanying chips were excellent too, soft texture and not too oily either. In fact I ate most of those before I polished off the halibut. I also noted that they weren’t overly salted as well, a nice touch by the kitchen as I’m finding more and more restaurants being very heavy handed with the sodium shakers of late. Nice to give the customer the choice to season them as they desire. The slaw, not great but I’ve yet to find a really solid slaw on a fish n chips plate. Maybe I’m not looking in the right place, but having it is necessary, to help cut the oily feeling in your mouth eating this kind of food. For $10, you get two largish pieces of cod (I'd say each is the size of a good banana, for comparison's sake!) and a nice serving of fries. A few tablespoons of good coleslaw (would have loved more) and enough tartar sauce to do the trick. Everything was crispy, not too much batter, fish was fried properly - that's all I ask for! Service was attentive, but relaxed when we came by on a rainy afternoon. We have been going to the Windjammer for about two years now and have always been satisfied with their excellent customer service. The fish n' chips are great, although, we liked it a lot more when they offered hamburgers and P'boy sandwiches. Nevertheless, it is still an excellent and yummy place to eat with reasonable prices. The Sungod R and B is great as well. It's not on the menu, but you have to have their deep fried Mars bar with ice-cream. To die for!!!! Love the place and the owner! 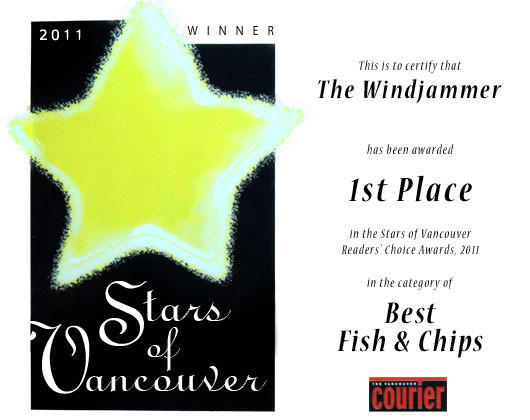 I've been trying to find good local places to eat fish and chips and came across Windjammers. When you walk in you feel as though you have just walked into a pub in England. The atmosphere is great and the food is exceptional. My fiancé and I started with the clam chowder and shrimp. The chowder was a bit watery for my liking. I like it to be thick and chunky. The shrimp on the other hand were GREAT!! They have a slight kick to them and come in a decent portion. you can't go wrong ordering them. We split a 3 piece halibut meal as that is my fiancé’s favorite type of fish. The fish was well cooked and the batter was really crispy. There was no grease on the plate and the portion size was good. Overall, I would recommend this place to anyone who has a craving for good fish and chips.